We are a non-profit organization 501 (C) (3). All donations are tax deductible. Our non-profit organization is strictly 100% volunteer work. Any money donated goes to rent, utilities, gasoline and food to give our clients. No amount is too small to give. Any other gifts needed are non-perishable food, black markers, your used/clean plastic grocery bags, and office supplies. All gifts are greatly appreciated and may the Lord richly bless you. Thank you to our current corporate food sponsors! THank you to recent corporate contributors! Thanks to USAIR employee Jim Smothers, his 50 hours of community service was rewarded by USAIR's Flights for 50 program and BREAD received $500 gift card! 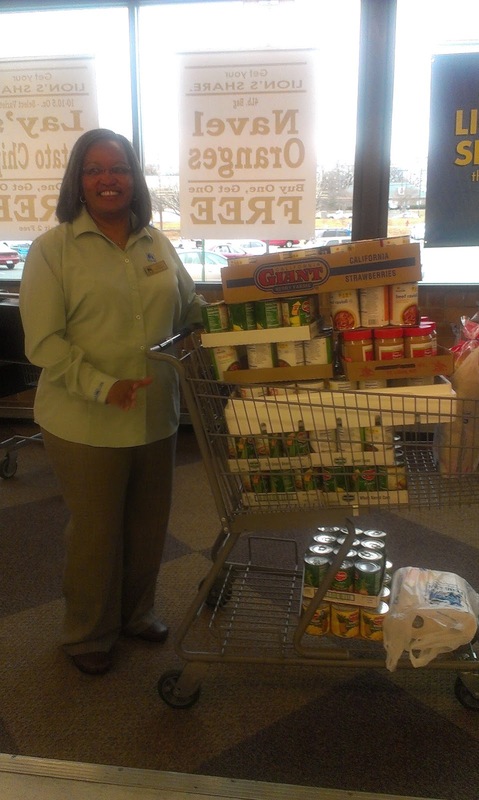 Food Lion Manager with $200 worth of the food donated to BREAD. Thanks so much! Save-A-Lot Manager (Bert) of W. Franklin, Gastonia with part of our gift card purchase. THANKS! Return Policy: All donations are non-refundable.